The AN/APN-232 CARA is a solid state radar altimeter system. 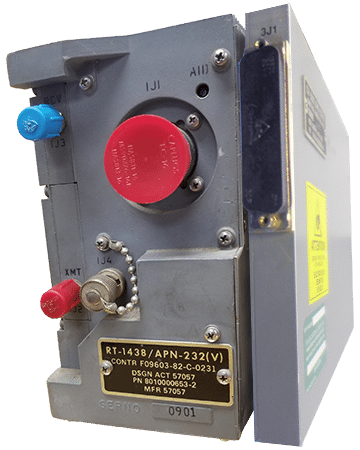 Its Receiver-Transmitter (R/T) RT-1438 transmits a signal through the antennas to the earth’s surface, receives the reflected signal, processes the information, and provides the resulting altitude-related data from 0 to 50,000 feet to various avionics systems. Duotech has extensive test and repair capabilities for the Receiver/Transmitter and Signal Data Converter components of both the AN/APN-232 and AN/APN-209. Even with tight funding and rising repair costs from the OEM, systems like the digital signal converter and receiver/transmitters radios of radar altimeters must be maintained to ensure mission critical components are ready to keep those fighters in the air. AS9100 certified, Duotech supports existing legacy and obsolete systems in aircraft like the F-15, F-16, and F-5 enabling operators to avoid scraping repairable equipment, while delivering under budget and meeting critical deadlines. Duotech provides repair services of electronic components for a variety of fixed wing and rotary wing aircraft systems. You can begin your Part Number Search or request a repair quote from Duotech today. TERRAIN TERRAIN, PULL UP! PULL UP!